Rarely do top contenders publicly state who they prefer to fight for the title, but in Nate Diaz’s case (Pictured), the Gracie Jiu Jitsu ties run deep. So it was hardly a surprise he favored a fight with Benson Henderson over Frankie Edgar. However, that doesn’t mean Mr.209 believes the right man left UFC 150 with the hardware this past Saturday. Edgar trains in New Jersey with Ricardo Almeida, who received his BJJ black belt under Renzo Gracie. As we all know by now, Diaz reps Cesar Gracie Jiu Jitsu. Speaking of Diaz’s talented squad, he believes the studs they have in their gym will make all the difference in preparing for the biggest fight of his life. Although, he couldn’t care less about competing for the belt, he just wants to take out the top lightweight in the UFC. 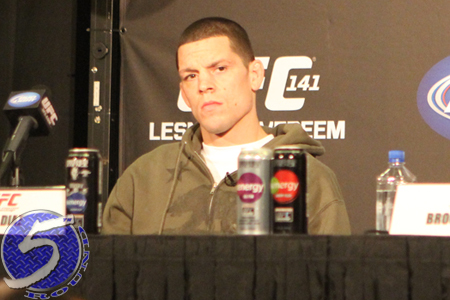 “I train with guys just like that – athletic guys, strong guys,” Diaz said. “It’s definitely gonna be a good, hard fight. Now it’s time to fight for a title. No word on when Henderson and Diaz will collide.